The Geographical Museum is dealing with collecting, preserving and organising of geographic and cartographic archival materials. Twelfe maps representing Carnioa during 16th and 19th century are exhibited. Special map of Duchy Carniola was exhibited. Its author is Henrik Karel Freyer. The map was made during 1844 and 1846, it contains sixteen lists in 1 : 113.500 scale. Exhibition of life and work of important slovene geographer Svetozar Ilešič. Eight maps in 1 : 5000 scale were exhibited. They represent part of Rapal border line between Kingdom of SHS and Kingdom of Italy. Exibition represented special teaching methods and requisite for blind and weak-eyed pupils. The museum is kept all the important work issued by the Geographical institute and a number of collections. Map collection encompasses maps for different purposes and at different scales from 16. century onwards. Besides general purpose maps there are also different thematic and topographic maps as well as school wall maps. A great deal of the material is connected to the Slovene territory and the neighbouring countries. Atlas collection encompasses more then two hundred atlases from 17. century onwards. Picture collection comprehends postcards and photographs of Slovene settlements as well as limited number of copperplate printings and lithographies. Among the most work are the first and second edition of Valvasor's Die Ehre des Hertzogthums Crain (Glory of the Duchy of Carniola), Münster edition of Ptolemy's Geography and colour Flojančič map of Carniola. 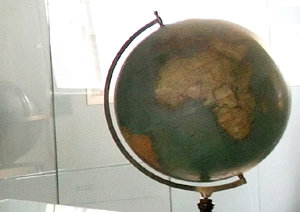 Other collections are a collection of older globes, a collection of statistical data on the Slovenian territory, a collection of material on the development of the geographic profession in Slovenia and the collection of the Triglav glacier. A part of Geographical Museum is also a hall situated at Gosposka ulica 16. It can hold up to 50 persons. It is suitable for home and visiting exhibitions, for work with school groups and for different activities, such as lectures, round table discussions, presentations of new books etc. The hall is due to its functional interior, good technical equipment and ideal downtown location suitable for meetings, gatherings and various exhibitions and can also be rented. Hall of the Geographical Museum.